FEATURE: In sanctuary, he missed his son's high school graduation. He hopes he can make the college one. In July of 2017, Samuel Oliver-Bruno had an appointment with an immigration officer. It was the same one he’d met with for the past three years to renew his stay of removal permit, a temporary measure that prevents Immigration and Customs Enforcement (ICE) from deporting him. Samuel’s first appointment took place around the time Donald Trump announced his candidacy for president; on his last, Samuel learned that the change of administration meant he had 30 days to pack up and leave the country. After being denied a subsequent appeal to renew his permit and facing the possibility of being separated from his sick wife and college-bound son, Samuel said he had lost all hope. “There were a lot of things going through my mind. I felt disappointed just at the thought of being forced to abandon my family,” he said, speaking through a translator. That’s when CityWell, UMC stepped in. Members of the bilingual church in Durham, North Carolina had been discussing the possibility of welcoming an immigrant into sanctuary for a year. When Samuel received his order of deportation, he called a friend at CityWell and asked the congregation to consider his case. The church had to act fast: Samuel only had two weeks before the deportation deadline. With a plane ticket bought and plans made to leave the country, he was offered legal sanctuary in CityWell’s basement just days before he was to be deported. “For me, at that moment, it felt like I believed. And it very much felt like God was opening a big door,” he said. Samuel is one of six immigrants in North Carolina who have taken sanctuary in churches during the Trump era. Juana Tobar Ortega, who immigrated to the U.S. in 1993, became the first person in the state to be welcomed into sanctuary in recent years after numerous failed attempts to gain permanent residency. Thanks to churches in Chapel Hill, Raleigh, Durham, and Greensboro who have welcomed immigrants through their doors, North Carolina now houses the most public cases of immigrants in sanctuary, according to Lori Fernald Khamala, Director of the North Carolina Immigrants Rights Program for the American Friends Service Committee (AFSC), an international peace organization. “The folks who choose to go into sanctuary- it is just an agonizing decision,” said Khamala, who has worked in the state for ten years. She says that her program has recently shifted their focus towards training leaders of immigrant communities to dispel fear and defend themselves against raids from ICE. AFSC also provides undocumented immigrants legal services and consultations to help them explore all their options towards gaining permanent residency. Confined to church property, Samuel cannot work, which poses a serious concern for his family because he is the breadwinner. Samuel’s wife Julia and his son Daniel live two hours away in Greenville and commute every weekend to visit him. His meals are provided by volunteers from the church and community, and the family faces challenging questions of how to pay for Julia’s medical care and Daniel’s college education. Some immigrants choose to go back to their home countries after exhausting their legal options and receiving an order of deportation, Khamala says. But Samuel views remaining in the U.S. as imperative. “Imagine if I would have given up and just gone back to Mexico. I then would have given up the chance to fight for this situation. To fight to stay. And that’s what has strengthened me to enter sanctuary and what’s continued to strengthen me- my family,” he said. The City Council of Durham unanimously passed a resolution on June 4th that affirmed the cause of immigrants seeking sanctuary. The resolution also urged Democratic Congressmen GK Butterfield and David Price, who both represent parts of Durham, “to present private bills to stop the deportation of Samuel Oliver-Bruno and José Heriberto Chicas,” the latter a 30-year resident of the U.S. seeking sanctuary in St. John’s Baptist Church School of Conversion. While the fate of Samuel’s residency status hangs in the balance, members of CityWell have embraced the opportunity to welcome him into their congregation. "To have Samuel here is to have a friend, it feels like a call to get to know another brother," says fellow parishioner Mary Claire Weiner-Kerr, a nurse. Katherine Guerrero, the Sanctuary Coordinator at CityWell who translated for this interview, helps to coordinate logistics with congregation members so that Samuel’s food, laundry, and medical needs are taken care of, as well as providing him with companionship. Samuel’s residency at CityWell also provides a learning opportunity for the congregation. Olivia Van Horn, another parishioner who teaches middle school science, highlighted that "for him to speak his truth can be super meaningful for people living in privilege, and for people embracing what's happening and trying to take action." 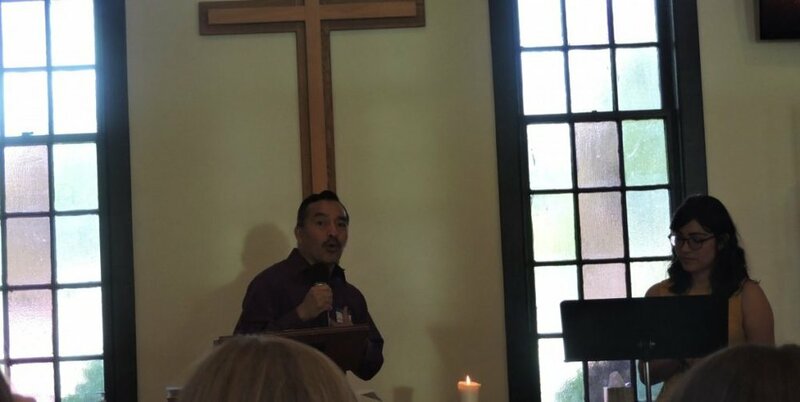 Having recently completed a course designed to train Hispanic faith leaders at Duke University, Samuel took the opportunity to preach to the CityWell congregation the day after our interview with Guerrero translating alongside him. Some members of the congregation have even encouraged Samuel to become a pastor, according to Guerrero.